Introducing the Strike Wireless Charging Pad for iPhone X, iPhone 8, iPhone 8 Plus, Samsung Galaxy S9, Samsung Galaxy S9 Plus, Samsung Galaxy Note 8, Samsung Galaxy S8, Samsung Galaxy S8 Plus and any device with wireless charging capability. The Strike Furniture Wireless Charging Pad is a new innovative charging solution for everyday use. The wireless charging pad can be seamlessly integrated onto any existing furniture and can charge any wireless charging capable mobile device. Strike's new line of wireless charging solutions for home & office are safe for everyday use. These Strike Wireless Charging Pads now feature iPhone XS & iPhone XS Max, iPhone XR, Samsung Galaxy S9, Samsung Galaxy S9 Plus, Samsung Galaxy Note 9, Samsung Galaxy S8 and Samsung Galaxy S8 Plus wireless charging compatibility. We have two types of wireless charging solutions for Apple and Samsung products (and other devices that have the wireless charging feature): The Strike Furniture Wireless Charging Pad and the Strike Portable Wireless Charging Pad. The Strike Furniture Wireless Charging Pad can be easily integrated on any existing furniture in your office or at home. It's so easy and convenient to use! The Strike Portable Wireless Charging Pad is a WPC Qi 1.1 compliant 5V input wireless charger. As it is portable, you can take the sleek and compact charger anywhere you like, so you can charge your smart devices wirelessly wherever you like. Just place your Qi-enabled mobile device on top of the wireless charging pad and it will start charging automatically. It can also function as a Wireless car charger. You’ll no longer need to plug a cable into your phone, tablets or phablets; just pop your phone onto the wirelessly charging pad and allow superior charging to take over. The Strike Wireless Charging Pads are the best wireless chargers on the market. 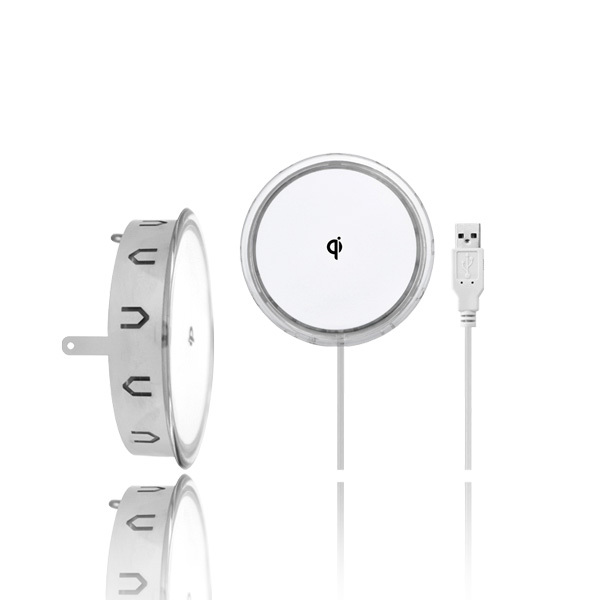 The wireless mobile pad is the perfect wireless charger for Android and iOS operating systems. Our Wireless Chargers can seamlessly and conveniently charge any wireless charging enabled devices safely and efficiently. These affordable wireless chargers are perfect for individuals with multiple devices that support wireless/inductive charging such as iPhone X, iPhone 8 & iPhone 8 Plus, Samsung Galaxy Note 8, Samsung Galaxy S7, and Samsung Galaxy S7 Edge, Samsung Galaxy S6, as the pads can already serve as a universal charger! Now, your device doesn't have to be physically plugged in. The Strike Wireless Charging Pad is the Qi wireless charger for all phones. Buy a Strike’s wireless charger today!